Mission work began in Huron in September of 1926. Within a short time many contacts were made,and on November 7, 1926, the worship services were held in the American Legion Hall over the Dexter Department Store at 33 1/2 Third Street SW. Twelve people were in attendance. Attendance grew, and on February 13, 1927, the congregation was formally organized. Property was purchased at Dakota Avenue and Eleventh Street SW for a new church building. A portable chapel was purchased, and on November 13, 1927, the new church building was dedicated. Under the blessing of God, the congregation grew. In 1933, the congregation became self-sustaining, having received mission subsidy from the South Dakota District of the Lutheran Church-Missouri Synod from its beginning. An addition to the church was dedicated on November 20, 1938. As the congregation continued to grow, a Building Committee was formed in 1947. The site at Seventh Street and Dakota Avenue South purchased in 1950. Ground was broken on Palm Sunday, April 13, 1955. The new church building was dedicated to the glory of God on August 12, 1956. Due to the need for additional educational facilities, a home was purchased on Kansas Avenue in 1963 for use as a parish hall. The building was later demolished providing additional parking space. The need for additional educational facilities was recognized, and in the spring of 1981, efforts were initiated to gather funds for the purpose of building new educational, fellowship and office facilities. Ground was broken on Easter Sunday, April 3, 1988, for a new fellowship hall and church offices. The new addition was dedicated on Reformation Sunday, October 30, 1988. During the Summer of 1989, the church basement was remodeled to provide an education area with permanent Sunday School classrooms. The new educational facilities were dedicated on Rally Day, September 10, 1989. In the fall of 1994 a weekday Christian preschool was begun, providing classes for three and four year olds. A Facility Expansion Feasibility Committee was formed in 1995 to study the possible need for expansion of the church facilities. In 1999, the Voters Assembly authorized a Facility Expansion Committee to plan for a new addition and begin receiving funds. On Palm Sunday 2003, ground was broken for the new Education Annex and Christian Activities Center. The addition was completed and dedicated on Palm Sunday, April 4, 2004. The addition includes additional classrooms, expanded preschool facilities, and a Christian Life Center. When Trinity Lutheran Church in Yale closed on December 31, 2004 many of the members of Trinity transferred their membership to Mt. Calvary. Over the years, God has abundantly blessed Mt. 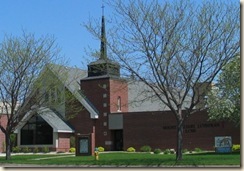 Calvary Lutheran Church through the faithful proclamation of His Word and the administration of the Sacraments. Now over 90 years, Mt. Calvary Lutheran Church numbers over 1,000 Baptized souls, including over 800 Communicant members.